A burger with a good size attached to it, the Mc-Boy is very tender and juicy, almost to the point where it falls apart as you eat it. The American cheese is melted pretty well and the caramelized onions provide a nice sweet taste. The bacon is prepared well, crunchy and plentiful, and the iceberg lettuce adds a different kind of moisture to the burger than its own juices; the sauce, is sweet and tangy, and really brings the whole thing together. All in all, a very good burger from Lazy Boy Saloon, and one that I would definitely recommend. Happy New Year! For the first review of 2016, I’ve decided to go out of state and talk about a delicious serving of Cider Spiced Ribs from the Whetstone Station Restaurant and Brewery in Brattleboro Vermont. But first, a little bit about the location. Whetstone Station is an absolutely wonderful establishment in Brattleboro that sits on the water and has a warm and friendly vibe; and along with having great entrees and deserts, their appetizers are some of the best around. While I unfortunately don’t have any pictures, I can easily recommend their Grilled Sirloin Tips, Pub Pretzel (served with outstanding beer cheese sauce), and their Spinach and Artichoke Dip (served with pita chips). If you get to order any of these, I also suggest trying their sauce sampler, as it is indescribably good. Smothered in sauce, these ribs are near perfection. The BBQ sauce is sweet, with a semi hot (but not overpowering) cider spice. 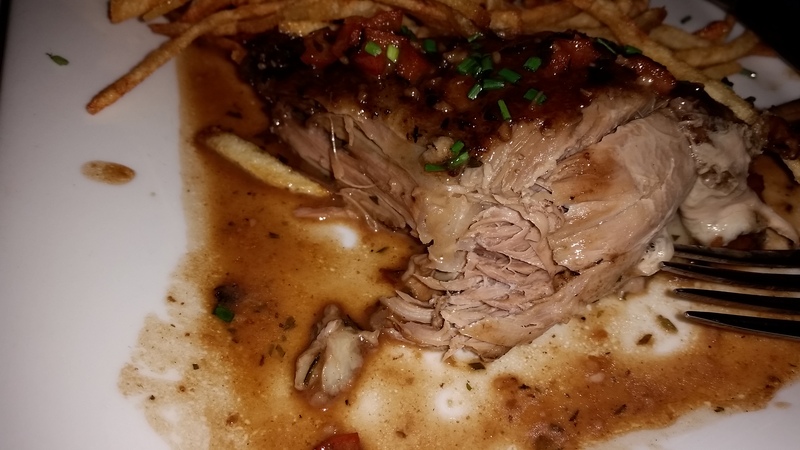 You could really taste the base flavors of the cider in the sauce, which was a great differentiation from so many other BBQ sauces that various restaurants use. 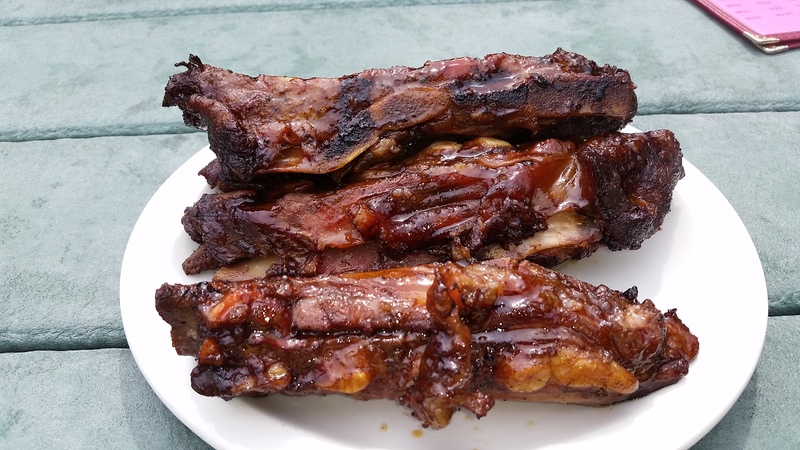 These are the kinds of ribs that you need a fork to eat with, because there is no way you are picking them up without the meat falling back to your plate. Tender and juicy, the meat mixes in with, and soaks up the sauce so that every bite is imbued with massive flavor. I highly recommend seeking out this restaurant and dish the next time you are in Vermont or are within driving distance of it; as both are too good to not try at least once in your life. As for me, I hope to make it back to Whetstone sometime this year, and see what else the have waiting for me to try. 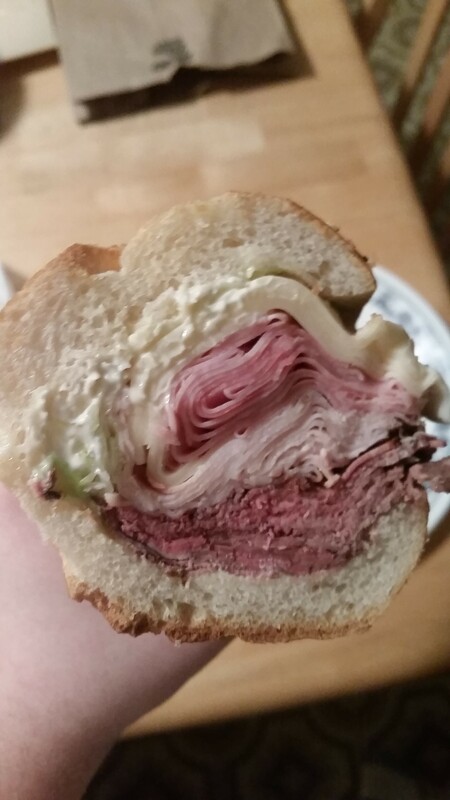 Best Burger, Best Plain Pizza, Best Specialty Pizza, Best Sicilian Pizza, Best BBQ, Best Bird, Best Desert, Best Milk Shake, Best Mac and Cheese, Best Penne Alla Vodka, Best “Other” Pasta, Best Appetizer, Best Side Dish, Best Soup/Chowder, Best Hot Sandwich, Best Deli Sandwich and Best Philly Cheesesteak. Each category will be broken down into the top 3 choices, and the winner will be chosen from the finalists. Certain categories that only have one choice in them, such as Steak, Salad, Burrito, Smoothie, etc. will be forwarded to next year’s awards when they will (hopefully) have some competition. With that out of the way, on with the awards! 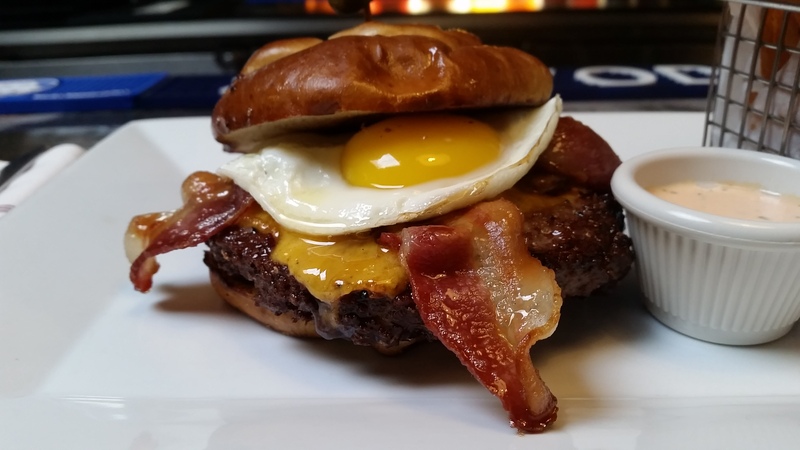 Winner: The Pretzel Burger – Westchester Burger Co. While the other two choices were both amazingly delicious, the Pretzel Burger just had no downsides. With a perfect patty, delicious melted cheese, crispy maple bacon and a pretzel bun, one can’t go wrong with this choice. Besides, when a burger can make me actually enjoy an egg, that’s an extra bonus. Winner: Plain Slice – Portofino’s. 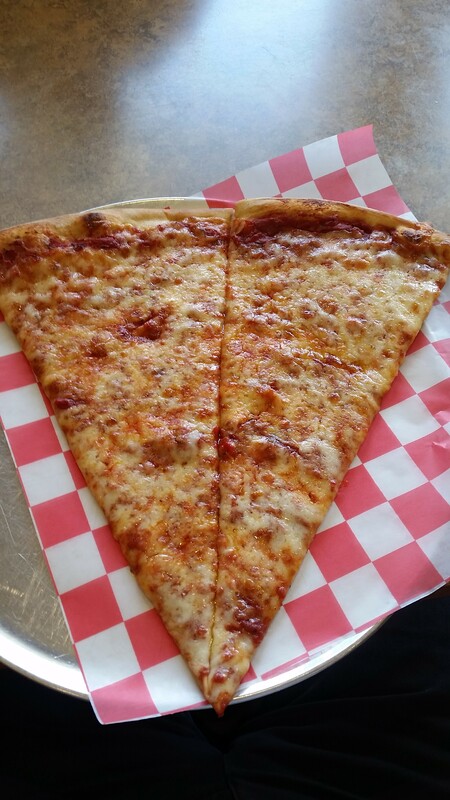 Portofino’s combines a great flavor with an amazingly sized slice. New York makes some of the best pizza in the world, and this slice easily ranks up there with the best of them. 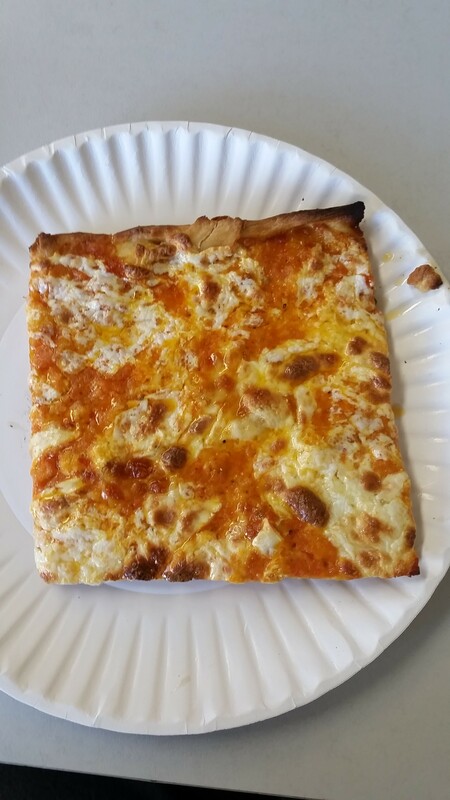 This slice beats out the other delicious specialties from Luca Bella and Tarantella, because the Vodka Sauce used on this slice is by far the best Vodka Sauce I’ve ever had. The idea to put this sauce on the pizza was inspired, and we are all better off for it. Nicky’s had thickness, Portofino’s had size, but Sal’s was perhaps the best Sicilian I’ve ever had, and certainly the best in Westchester. 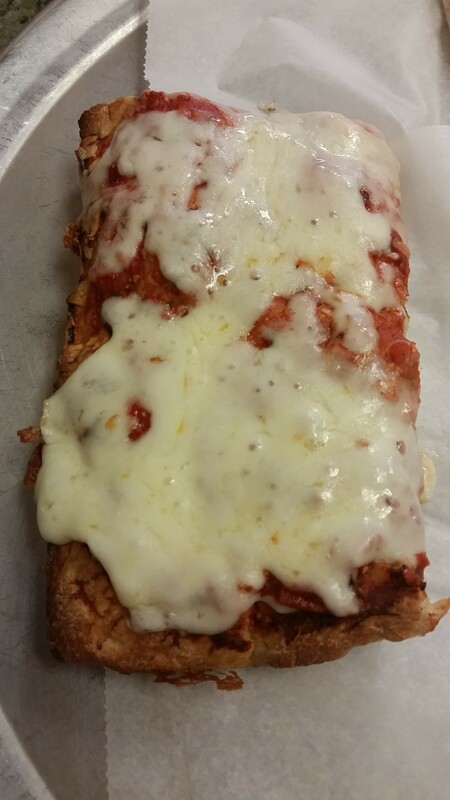 Light and airy, and yet somehow filling; with perfectly melted cheese and an amazing sauce, Sal’s Sicilian pizza earns the easy victory. Winner: The Trash Rib Teasers – Holy Smoke. Believe it or not, the rib teasers actually beat out a full rack and pulled pork, mainly due to how meaty and flavorful a rib Holy Smoke was able to concoct. 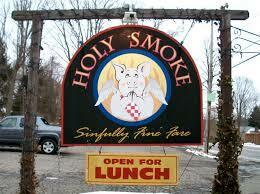 The Texas ribs were great, but Holy Smoke gets the edge. 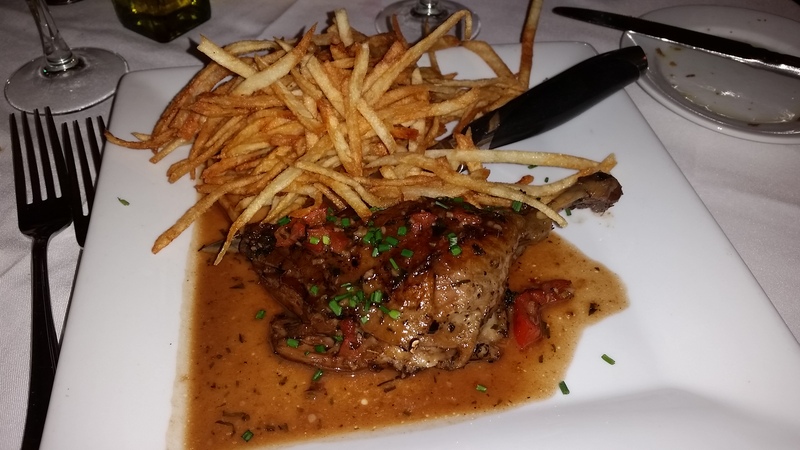 Winner: Duck Confit – Le Provencal. If I’m being honest, I don’t like eating birds that much; so many places just don’t do a good job preparing them. Holy Smoke and Le Provencal are two establishments who know what they are doing. I went with the Duck because it was simply one of the best birds I’ve ever had. In my review I described it as “the steak of birds” and in the end, that is what sealed the victory for the Duck Confit. Winner: Cheesecake – Westchester Burger Co. 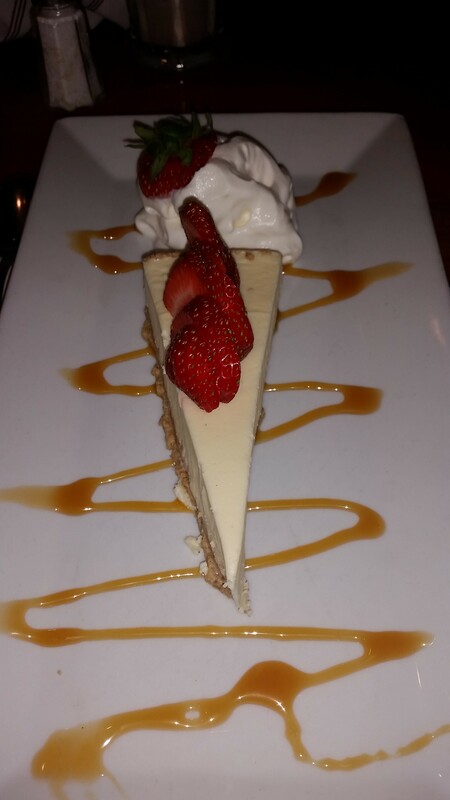 This was a harder decision than you might think; the black salted caramel is one of the most unique and delicious things I’ve ever tasted, but the Cheesecake won in part due to its light, and rich texture and flavor. The plating of the desert was also an added bonus but did not play into the decision. 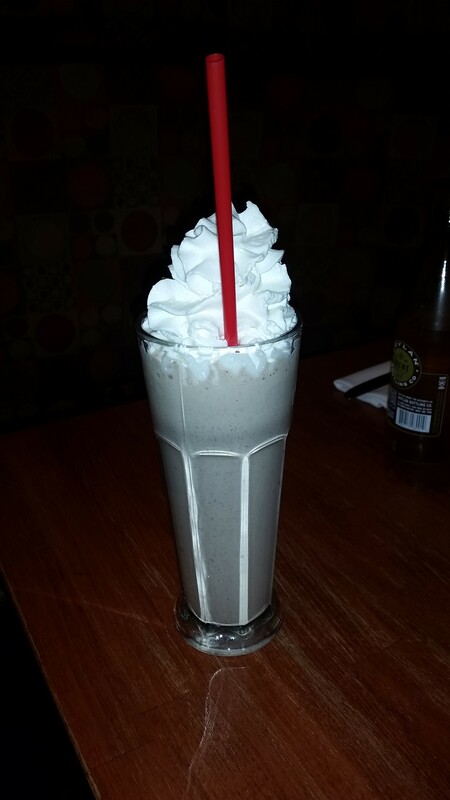 Winner: Italian Nutella Milkshake – Westchester Burger Co. The specialty milkshake carries the day. I love chocolate milkshakes, but the Italian Nutella was just too good not to win. The flavor was unique, and it was made so well. Both were great, but WBC’s was just better. Best Mac and Cheese: Mac and Cheese (Piper’s Kilt) vs. Deluxe Cheeseburger Mac (Mr. Mac’s) vs. Philly Cheese Steak Mac (Mr. Mac’s). 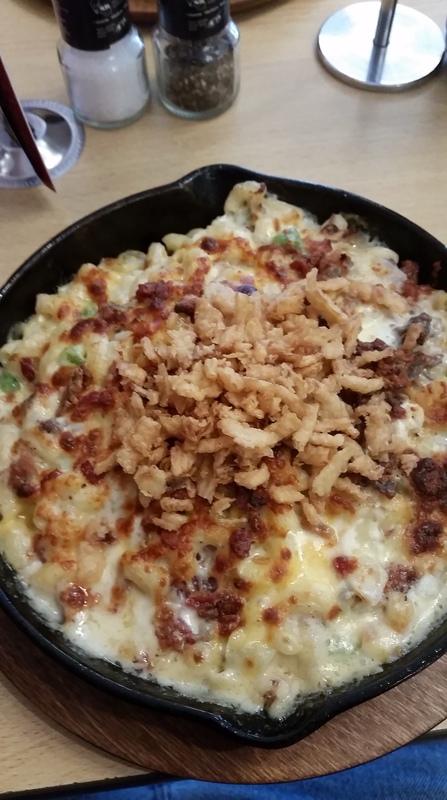 Winner: Philly Cheese Steak Mac – Mr. Mac’s. Man, I wish this restaurant would come to New York! The Philly-Mac was simply one of the best things I’ve ever had. The Macaroni and Cheese portion was great, and made even better by an authentic taste of the Philly Cheesesteak. Not only that, but it also has great re-heat value; and while I love the Mac at Piper’s Kilt, Mr. Mac’s specialty is their Mac and Cheese, and this is one of the best. Its the sauce. 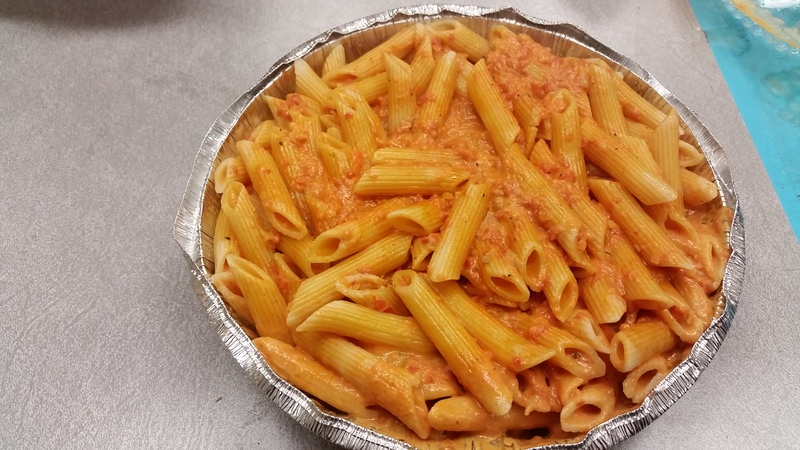 In the same way that Luca Bella won best specialty pizza with their Vodka Sauce slice, they win the Penne category with the sauce being where it was always meant to be, on pasta. It was a hard choice given that Sal’s sauce included a few extra and delicious elements, but in the end, Luca Bella’s sauce was just that much better. A country club take on spinach ravioli, these pillows were not only delicious, but presented in a wonderful manner. 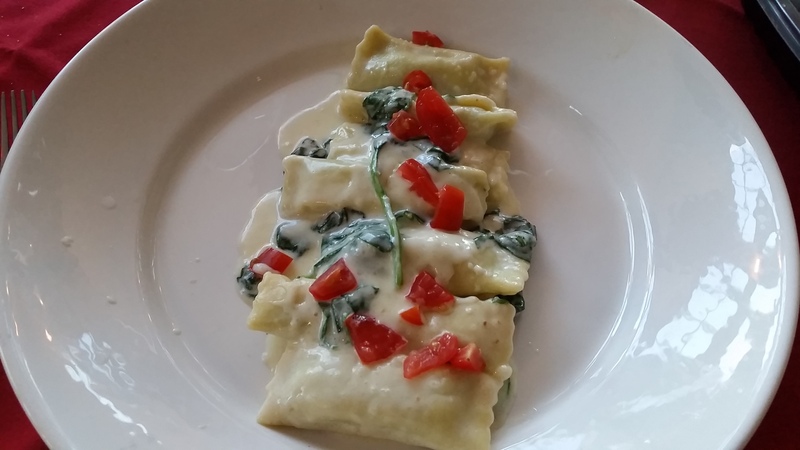 The spinach and ricotta meld beautifully and just made for a great pasta dish. 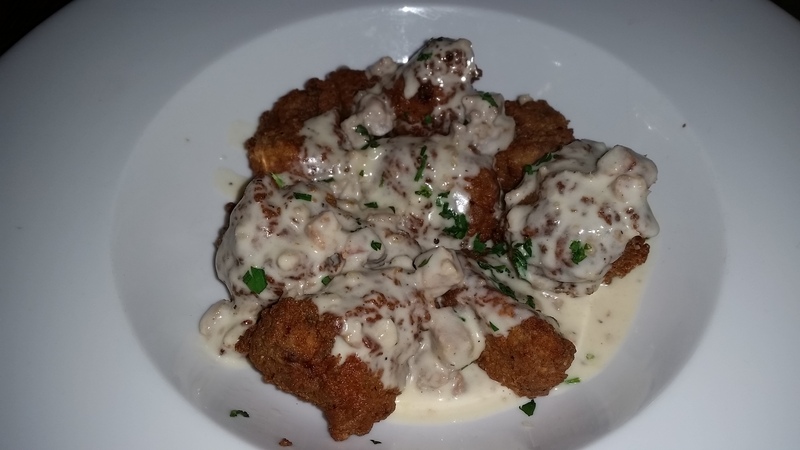 Winner: Chicken Fried Steak Bites – Prohibition River. Possibly the toughest choice so far; on one hand you have a a wonderful Charcuterie dish, but you also have a fantastic meatball offering. But the Chicken Fried Steak Bites get the victory because it is one of the most delicious appetizers out there. Filet Mignon steak bites, with a deliciously crispy skin and a fantastic gravy? How could it not get the win? Winner: Garlic Balls – PPT’s. 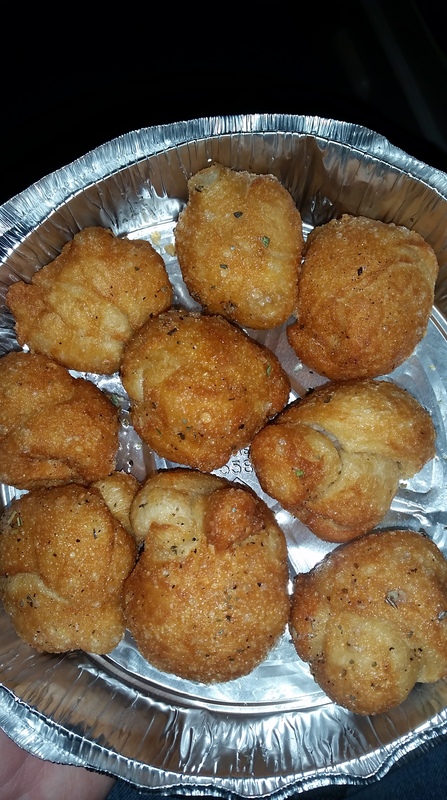 The ultimate side to pizza, Garlic Balls from PPT’s are doughy, sweet, and full of Garlic. It is easily one of the most unique side dishes out there, and a must try for anyone who likes good food. 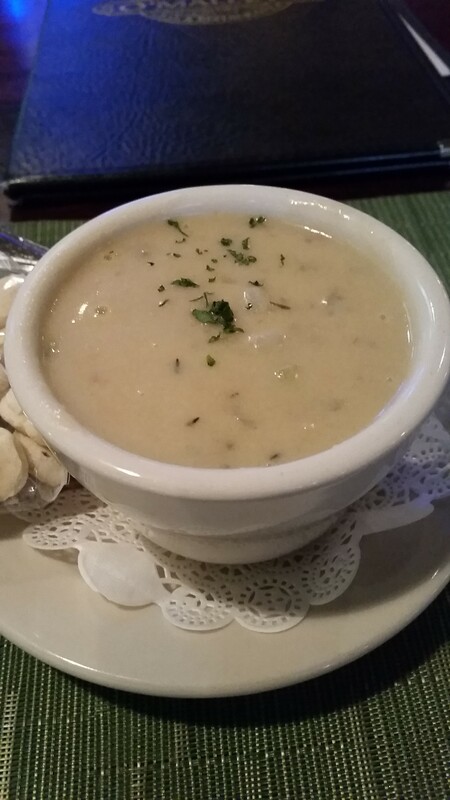 Winner: New England Clam Chowder – O’Malley’s. Very easily the best New England Clam Chowder I’ve had, as it is the specialty of the Chef at O’Malley’s. It is thick, creamy, and has great clams. An easy dish to return to over and over, and I do almost every time I go to O’Malley’s. 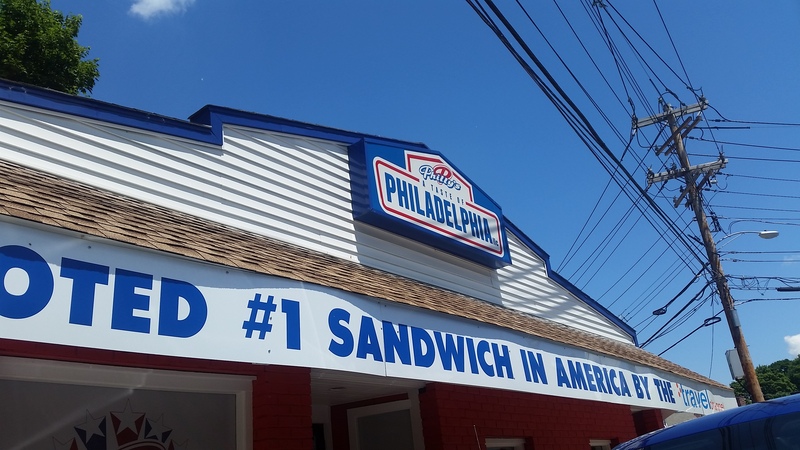 Winner: Phive All Day – Philly’s: A Taste of Philadelphia. 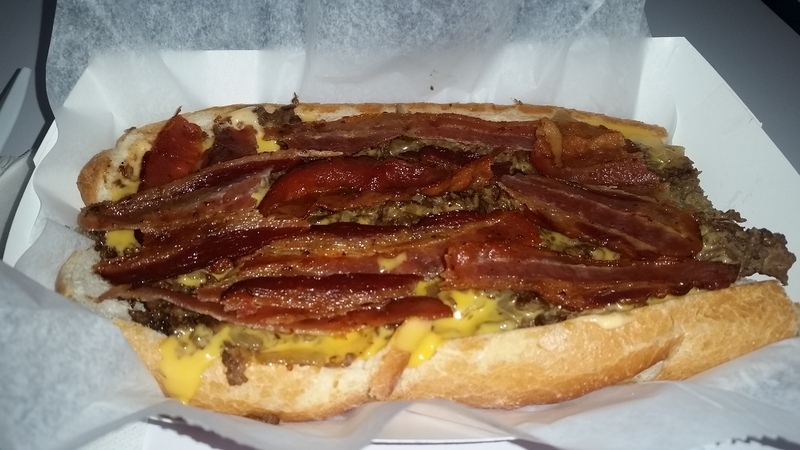 One of the most unique and succulent sandwiches out there, the Phive All Day wins based on its combination of traditional Philly Cheesesteak elements, but with the fantastic additions of bacon and home-made “McNabb Sauce.” (Note: This Sandwich will not be considered for the category of Philly Cheesesteak because it has too many unique elements). Winner: American Combo – Anthony’s Deli. Another tough choice, especially considering that the Godfather is Anthony’s signature sandwich. Don’t get me wrong, the Godfather is a fantastic Italian Sandwich (as is Rooster’s Sicilian), but the American Combo just has the “it factor” in terms of traditional deli sandwiches. The bread, as well as every meat used is fresh, and the size is fantastic. I’ve had all three of these sandwiches on multiple occasions, but the American Combo is the one that I go back to the most. Winner: Philly Cheesesteak – Silver Lake Pizza. 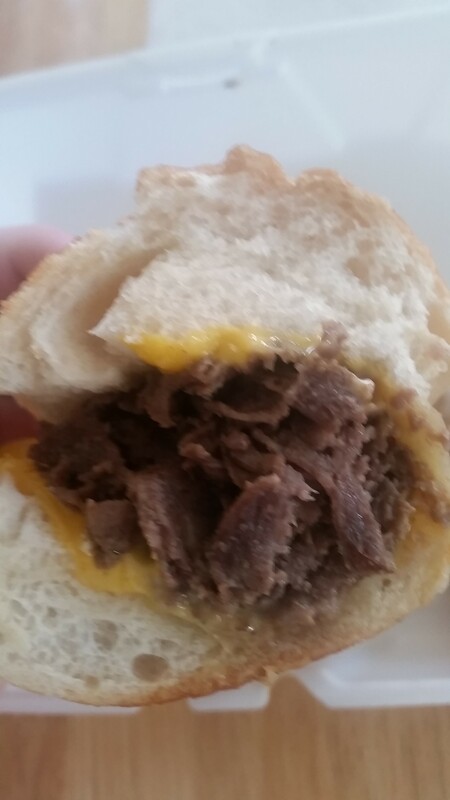 Easily my favorite Philly Cheesesteak, Silver Lake Pizza knows what they are doing in regards to this sandwich. The bread is crisp, the meat is thick and flavorful, the cheese is melted perfectly, and the peppers and onions are a nice addition to this juicy sandwich. 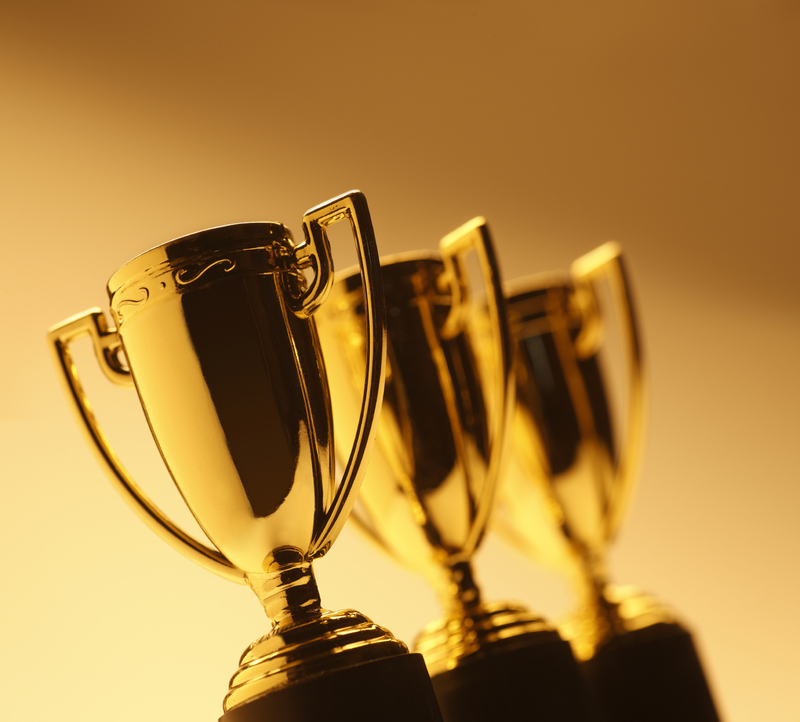 That’s it for the First Annual Pristine Awards, thanks so much for reading and I hope to see you back in the New Year! Its time to visit one of the best Burger joints in Peekskill: The Branding Iron. This is one hearty burger. It is filling, huge, and quite good. It is so big that it is almost impossible to get your mouth around it for the first few bites. The patty itself is pretty big and has good flavor, the cheddar cheese is melted well, and the BBQ sauce (instead of ketchup) is nice and sweet. The onion ring on the burger has a nice crunch, and the sauteed onions were plentiful, as was the crispy bacon. The bun is brioche and and coated in butter before it is grilled, and in keeping with the theme of the name, is branded on top. Interestingly, the brand itself smells similar to a somewhat charred marshmallow you’d have as a kid. So if you are ever in the Northwest section of Westchester and want a good burger, visit the Branding Iron in Peekskill, you won’t be disappointed. If you are in the mood for something delicious and exotic, Coriander Modern Indian may just be the place for you. I admittedly have not had much Indian food in my life, but my visit to Coriander will certainly change that. When I told my friend that I would be having Indian food, he implored me to have Lamb Tikka Masala, and while technically only Chicken Tikka Masala is on Coriander’s menu, they will gladly make it with lamb if you ask for it. My friend was absolutely right, Lamb Tikka Masala is a must have, especially at Coriander. The sauce is a combination sweet, spicy, and plentiful; it engulfs the entire dish in a proverbial pool of flavor. The lamb is large, thick, and very tender, and mixed in with the sauce, it tastes out of this world. Furthermore, it is garnished quite nicely. Traditionally it is eaten with rice, and while one can put the rice on a plate and spoon the Tikka Masala over it, I’ve found that I enjoy putting the rice in the bowl and having everything meld together. Also, try the naan bread, it is excellent. For a delicious Indian meal in a nice modern atmosphere, get yourself over to Coriander in White Plains or Larchmont; its a great place to try something new, or have a great version of an old favorite. Happy Columbus Day! In the spirit of the intrepid Italian explorer, I thought what better food to review than everyone’s favorite Italian dish…pizza! Today’s venue: Sal’s Pizza in Mamaroneck. 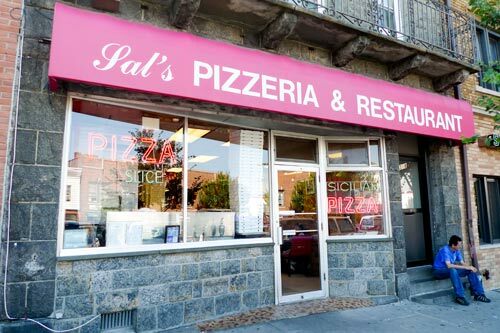 Having been in business for over half a century, Sal’s Pizzeria and Restaurant should know a thing or two about pizza, and thankfully, they do. Sal’s claim to fame is their Sicilian, and with receiving multiple recommendations in the span of a couple weeks, I new this was a slice I needed to try. Did Sal’s pizza live up to the recommendations? Absolutely. In fact, it may be one of the best Sicilians I’ve had. The dough was fluffy, light, and airy; a quality that allows you to eat more than one slice and still have room for more. The cheese was perfectly melted and had a great oozing quality (yes, that is a good thing!). The crust is crunchy, but not too hard, and the light splash of sauce was an interesting combination of sweet and slightly tangy (although not at all acidic). Its a nice compliment to the dough and the cheese. How should you celebrate Columbus Day? By eating a slice of pizza, and what better place to eat it than at Sal’s Pizza; and if you are reading this after Columbus Day, that’s no problem, because Sal’s is still the place you need to go. 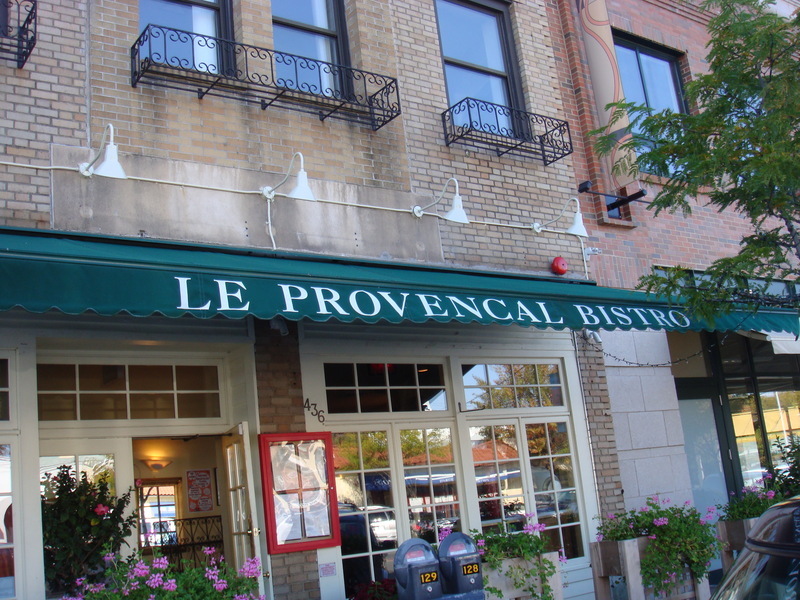 Le Provençal is a lovely little bistro located in the town of Mamaroneck, and when my friend came down and was craving some French food, this is where we decided to go. For my meal I decided to try something I had never had before, duck, and oh boy was that a good decision because this is one of the best cooked birds I have ever had. This dish is making me say something I never thought I’d say; duck is the steak of birds; and when I say that, I literally mean it reminded me of a steak. The meat was thick, but shredded easily enough to consume quickly (unlike some steaks that require you chew for awhile), and the port wine sauce that it was bathed in was sweet and delicious. This meal simply melts in your mouth, thats how good it is. I absolutely recommend that everyone who reads this tries this dish, it is one of the best meals, let alone birds, I have ever eaten. Not to mention that for such a fancy and high quality meal, it is very reasonably priced; and their wine selection is quite good. It is also worth mentioning that, although unrelated to the taste of the food itself, the owners and staff are very nice, knowledgeable, and helpful, making the dining experience a good one. I hope you get a chance to experience it soon. These ribs are absolutely fantastic. they are very thick and meaty, with moist flesh that has a nice, partially resistant tear off the bone. Each rib (there are four of them) is smoky in flavor, but is also doused with a good amount of sweet, (almost syrupy) BBQ sauce that fully enhances the flavor. I cannot recommend these ribs enough; if you are going to spend a meal time at Holy Smoke, order these teasers as your appetizer, and enjoy this wonderful addition to a great BBQ restaurant.